Each year we need the help of volunteers to keep the work of the Fund going. We warmly invite applications from people who are interested in becoming volunteer English teachers in Santa María de Fe. please read these before sending in an enquiry about volunteering. Yes you do. In the words of the Common European Framework of Reference for Languages, you should be able to “interact with a degree of fluency and spontaneity that makes regular interaction with native speakers quite possible without strain for either party” (level B2). If you do British exams, it probably means a minimum level of A in A level or equivalent. The essential point is that you must be independent of translators and interpreters, and able to negotiate points of detail both with the family you live with, and with anyone else in the village. It is heartbreaking for us to read the CV of someone who is absolutely brilliant in every respect, but is not yet an independent Spanish speaker. So please do not apply with a promise that you will get up your Spanish: get it up first, and then apply. There is no upper age limit and we have had great success with older volunteers. We do not usually take gap- year students pre-university, but have done occasionally. Most of our volunteers have been university students of Spanish in their year abroad, so around 21 or 22. This is a good age, as you will be around the same age as most of your students, which gives you an immediate entrée into the social life of the village. Do I need to speak British English? We will find you a family to stay with, and will suggest you stay there at least one month, so that you get an introduction to the village and the culture. After a month you are free to move without any hard feelings (to rent your own house, or to another family), although the great majority of our volunteers stay in the same family throughout their stay. Ideally three. Sometimes we only have one or two. We would not normally take more than three unless we got an outstanding application. Unlike most overseas volunteer programmes, you do not pay us anything: there is no administration fee. At the same time, you do not get paid anything (unlike VSO or the Peace Corps, for example). You must pay your all your expenses, including your flight, your travel insurance (compulsory, as we do not insure you), your board and lodging, and your internet use. Your board and lodging will cost you around Gs750,000 a month (which is at the time of writing £98 or $133: you can check the up-to-date exchange rate on http://www.oanda.com/currency/converter/). You do not pay any of this to us: your board and lodging goes to your family direct. What is the minimum volunteer period? We like volunteers to stay a minimum of five months but will sometimes take them for three months if there is a gap. In no circumstances will be consider a volunteer period of less than one month. The longer you can stay, the higher your chances of being accepted. And the longer you stay, the more effective you become and the more you get out of the experience. What are the best dates for starting? Our year is divided into two semesters, February to early July and late July to November, so these are ideal volunteering periods. There are fewer classes in December and January, because it is the summer holiday, but there are some. We can be flexible about starting dates so do get in touch if you are interested in volunteering for a different time period. We try to have volunteers overlap by a week at least, so the new volunteers can learn the ropes from the outgoing ones. Most of our classes are with students aged 13 and upwards, but most are of university age, and some are in their late 20s or early 30s. We also have a children’s programme for ages 8 to 12. There is selection for the adult programme but not for the children’s programme (though there is streaming). We have classes from zero Beginners up to Advanced. Most of the classes are small (between 2 and 15 students) though we have bigger classes when we are running a new beginners’ course. Those in our adult programme have classes every day Monday to Friday. The frequency of the children’s classes depends on the availability of teachers, though we try to have them at least twice a week. How many hours a day will I be teaching? This is variable and depends on how many other volunteers we have, and also to a some extent on how much free time you like to have. But it would be a minimum of two hours and a maximum of six hours a day. What else is there to do when I am not teaching? Santa María does not have anything in the way of night clubs or cinemas. But here are some of the activities that previous volunteers have been engaged in: sewing with the craftswomen; folk dancing; horse riding; attending occasional classes at the nearby Universidad Católica; playing volleyball; taking Guaraní classes; singing in the church choir; learning the harp or the violin or the guitar; reading books from the local library; visiting the local museum and studying the history of the Jesuit-Guarani Reductions in the Hotel library; helping out in the nursery; going away at the weekends to explore Paraguay; writing an extended essay for their university on an aspect of local culture or history; but most of all, drinking tereré and chatting with the local people. What other qualities can help my application? The most important one is a genuine desire to live with and work with the poor. This is a third-world country and you cannot expect first-world standards of accommodation or of transport or of anything else. The job satisfaction comes from seeing opportunities open up for intelligent young people from poor homes who have no possibility of learning English except in free classes. 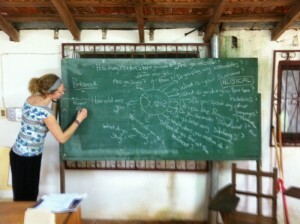 SMEF also runs music classes so those with musical talents may be called on to teach music theory. We also have classes in other languages (French, Italian, Portuguese, Latin, so far), but these depend on when we have volunteers able to teach those languages and with time to do so after their commitments to English teaching. You may get called on to interpret for the Santa Maria Hotel when we have English-speaking guests (although the Hotel managers speak English). Other skills can often be helpful too, so let us know about all aspects of your experience and expertise. Send your CV to info@santamariadefe.org together with the names and email addresses of 3 referees: one for your level of Spanish; one previous employer; and one character referee. If you have a skype address, let us have it. Shortlisted candidates will be interviewed in Spanish, and we can provide them with contact details of previous volunteers to consult about the experience. What do previous volunteers say? Find out on the Volunteers’ Stories page!